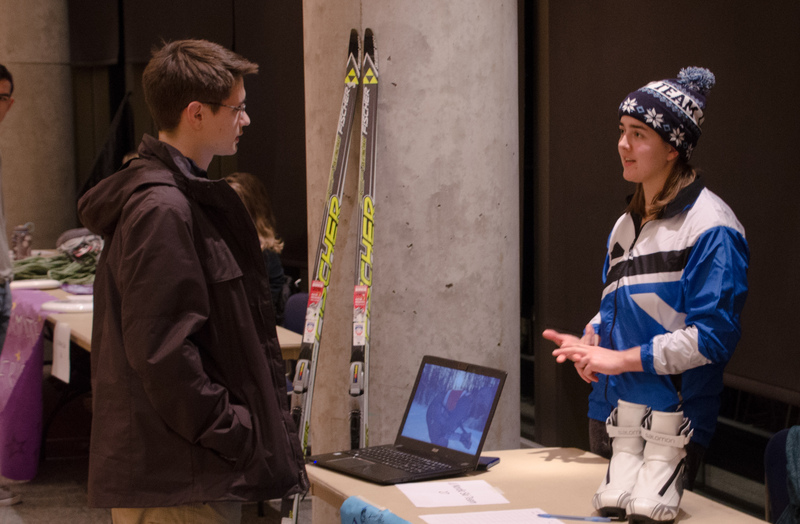 Senior Maggie Anderson speaks to an interested student about Lawrence’s Nordic Ski Team. On Friday, Jan. 11 from 5:30 p.m. to 7 p.m. the Winter Activities Fair was held in the Somerset Room of Warch. While the event was more sparsely attended than the Fall Activities Fair, dozens of student organization representatives set up tables with information about their clubs. Many clubs had incentives for students who signed up. Lawrence University Student Organized Programming (SOUP) handed out stress-toy penguins and many clubs had candy. Others had poster boards with information or educational videos set up on laptops. Music was playing throughout the duration of the fair and members of Phi Kappa Tau and Beta Theta Pi could be seen dancing at their tables. The next Activities Fair will take place in Fall 2019, but more info on clubs can be found on the Lawrence home page.